Ḥorvat Maẓad (Khirbet el-Qasr, Khirbet el-Kusr) is situated on a hilltop overlooking Wadi Alaqa, about 530 m above sea level, on either side of the Roman road between Abu Ghosh and Emmaus. A fragmented inscribed milestone was found in situ at the site, which is eminently suitable for a way station, lying as it does in a prominent place with excellent views to the east and west. C. R. Conder and H. H. Kitchener first noted its connection with the Roman road in the late 1880s, and C. Clermont-Ganneau also made mention of it. The site and its surroundings attracted the scientific interest of the German Protestant Institute of Archaeology at Jerusalem, which organized several surveys there. A. E. Mader as well as C. Kuhl and W. Meinhold present descriptions of the ruins and the traces of the ancient road, including milestones in the area. During the British Mandatory period, Ḥorvat Maẓad was inspected several times by archaeologists of the Department of Antiquities. In 1972, M. Gichon included the site in the research program of the Israel Milestone Committee. 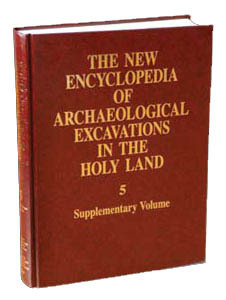 Three seasons of excavations (1977, 1978, 1980), followed by shorter campaigns of soundings and surveys (1984, 1998), were directed by M. Fischer on behalf of the Institute of Archaeology and the Department of Classics, Tel Aviv University. Excavations were carried out in five areas: areas A, B, D, and E in the northern part of the site; and area C in the southern. Seven layers of settlement were recorded.